Learn how online staffing is more than global online freelancer marketplaces, Some of the tools staffing firms are using to manage their online endeavors, and much more. Did you know that the average executive gets more than 5,000 emails a month? So how do you get people to read your email? Start by downloading this eBook! Check out what other staffing firms are doing...and what's really working in email marketing. You'll see how to craft your emails to maximize response, how to integrate email marketing with your social media, how to use landing pages to get readers to take action, how to measure and track results, and much more! Like the eBook? Check out our webinar on email marketing and content marketing. >> Click here to watch the webinar. Ask Haley: Will creating inbound links help our SEO? Highest ROI. Fastest response. That's the value of email marketing. 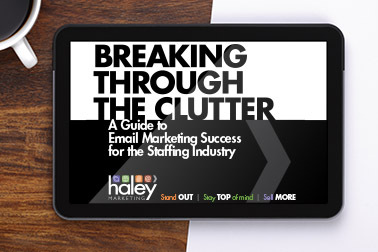 I hope you enjoy our completely updated eBook on email marketing for the staffing industry. You'll find some great new ideas to help you get more response from your email. And speaking of response, will we see you at Staffing World? If you're headed to ASA, contact us to book a complimentary consult on your marketing plans. We'll share lots of ideas to help you drive sales and improve your recruiting. If you're not headed to ASA, don't miss our post-conference recap webinar. We're going to share the highlights from this year's conference.